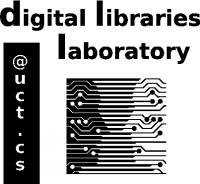 The Digital Libraries Laboratory conducts research and provides support for information management problems with particular emphasis on the poor countries of the world with their associated unique constraints, such as cultural differences, limited Internet bandwidth and limited access to skilled staff. Our activities are research-focused, but include some advocacy, training and consulting. Our work is oriented towards the goal of making all forms of information (heritage, research, education, etc.) more accessible to all people. For completeness, these pages also reflect all digital library activities within the CS department pre-2008, including those conducted within the AIM, CVC and HPC laboratories, and work conducted by Hussein Suleman before joining UCT. As of 2013, the DL laboratory is part of the Centre for ICT for Development. Students, projects and publications listed are typically related to either ICT4D, Digital Libraries or at the intersection of the 2 areas. As of 2015, Maria Keet and her students have joined the DL laboratory, with a focus on multilingualism and African languages. Contact Hussein if you have any queries.